Who knew a bunny and a tortoise would require so much supervision? Darwin is at it again! I am always so pleased when you ask me about Darwin. He has his own little fan club, and nothing could please me more. This time of year we watch him closely. OK…don’t laugh! That really was a the first time I’d seen that message. I didn’t even know the car had the capability to sense potential road hazards. 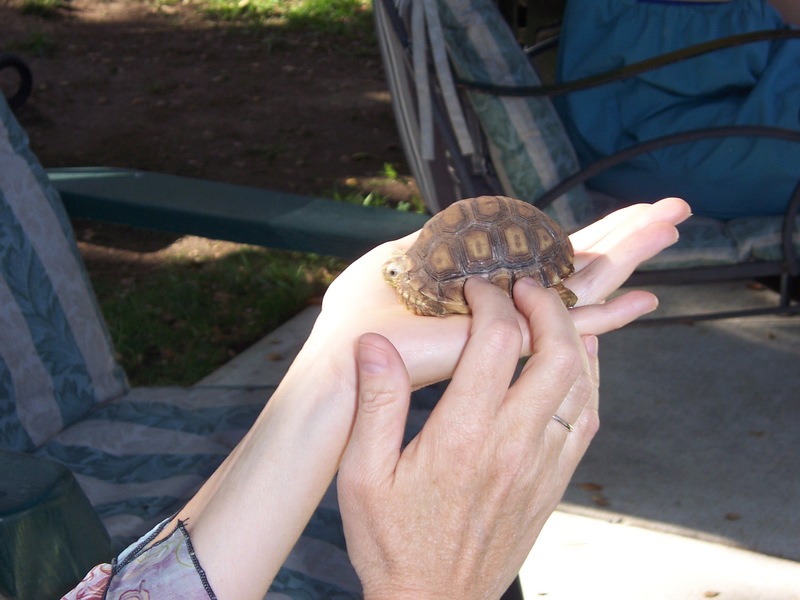 I don’t worry about the roads, but I do have concern for an African Sulcata Tortoise who needs consistent warmth. This time of year he needs a lamp and belly pad, protection from the wind and burrowing materials. He doesn’t leave the green house for days at a time. Pinky has a nice little condo, and we can easily monitor her warmth. She has plenty of dry timothy hay, an upstairs covered room with a view and a very small cubby we call “the panic room.” If she’s concerned for safety, or presumably needs more warmth, she can hide out in a totally concealed space. Out came the sun–and so did Darwin! Oh great! Another engineering dilemma. I’d prefer a less cluttered view, but Darwin can push Pinky’s swinging door wide open! So now we block the door! 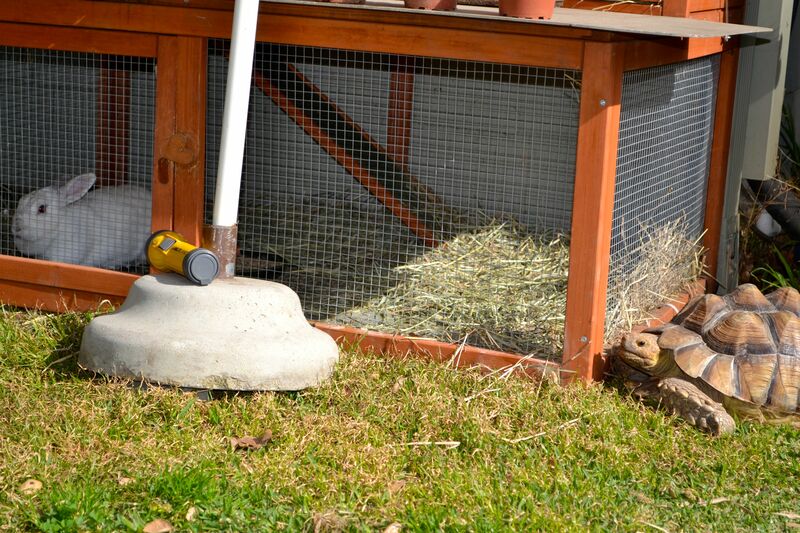 There is an umbrella to keep exposed timothy hay dry, and a piece of old wood flooring blocks the door. Are we holding Pinky in, or keeping Darwin OUT! He still has a good view, and they can converse. Pinky is just as interested in Darwin’s chow! She sits in the corner eyeing him with interest, probably imagining his outdoor freedom…and generous diet! He doesn’t look wily, does he? He isn’t particularly mischievous. He’s just BIG, and very heavy. And when he wants something, he makes his wishes known. When he first came to live with us, we never could have imagined how many adaptive measures would be necessary to keep everyone safe–and content! And don’t let the sunshine in the photos fool you! Today is cold and rainy. Darwin won’t need my supervision, so I have a little field trip planned to follow another one of my interests. I’ll take my camera. I breathe lighter when I take the time to shift gears from a week jammed with responsibilities and tight scheduling. A little field trip today will usher in the weekend with a good exhale! It’s your weekend, too. Don’t forget to de-stressify! I knew eating lettuce would make you fat! We were very lucky with the storm. I live an hour north of Philadelphia and we were on the edge. We got 4 inches of snow overnight and all the roads were cleared by morning. It’s cold and breezy but I believe New England go it much worse. I do love Darwin–quite the condo you have set up. 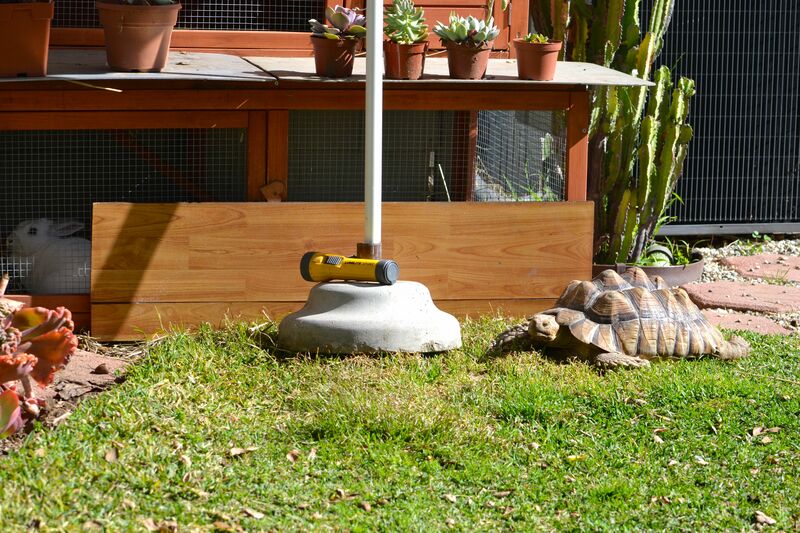 I still would love to have a backyard tortoise…I imagine l would be moving boards and umbrellas too. We do fuss over the animals, Alice, which at times is funny. A tortoise and bunny really can be left without too much care when we are gone for a short time, like a weekend, but we always arrange for someone to keep an eye on them. We almost took in a rescue dog last year and because we’re both still working I decided we couldn’t do it right now. I’m absolutely sure we’d be obsessed over it during the day! LOL! 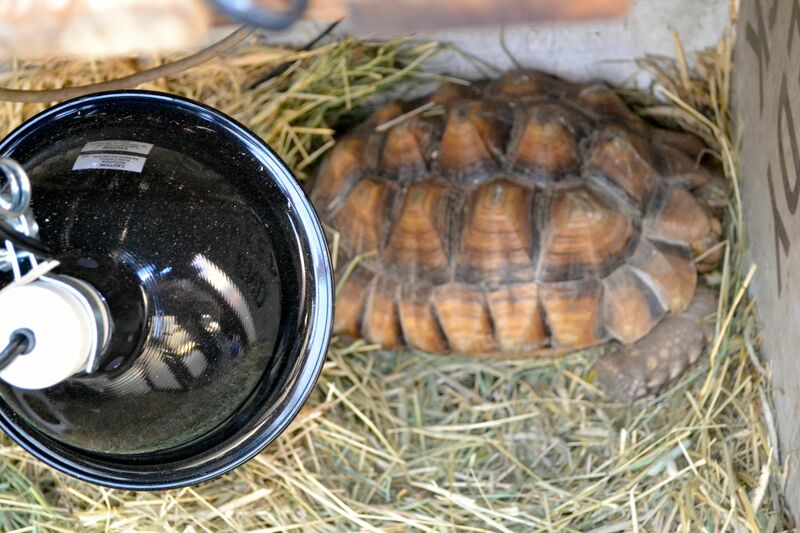 We have a much smaller box tortoise that lives his life mostly in a terrarium. 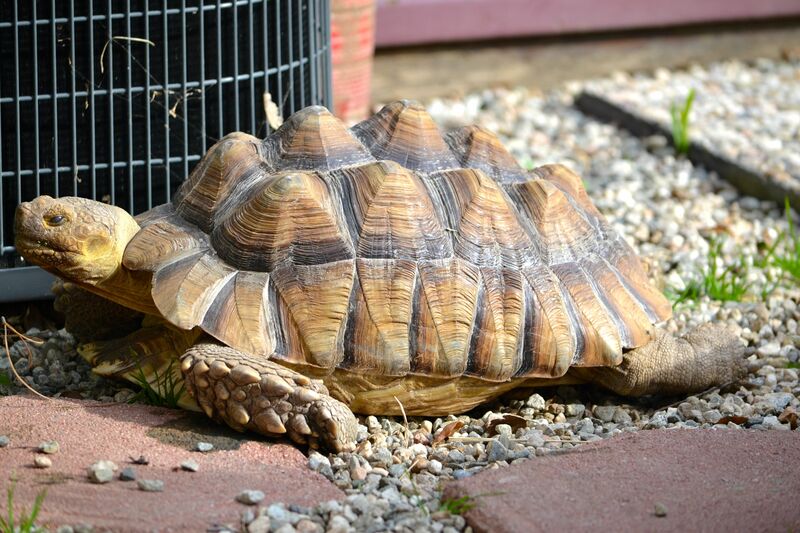 He’s a sweetie and maybe a good choice for someone who isn’t quite as sure they want to provide for a tortoise that grows as quickly as a Sulcata. But Rocky, the little guy, has to stay in his terrarium because as an escapee he can really make tracks. We’ve lost him for days at a time! Thanks so much for stopping by today, Alice. I do hope you have a good weekend! I used your phrase at work yesterday. We’ve had a very busy six weeks and this past week was like a nice big exhale. No chaos. I’m ready for the weekend though. We’ve had a lot of after work/school activities this week (something each night). It’s time for us to plan a field trip too. I think I’ll work on that this weekend. So glad for the Darwin update today. I do just adore that guy. I’ve never known a tortoise with such personality. He is one assertive little guy. I love it! Have a great weekend Debra. Indeed, what a cute story to head into this (cold, wet) weekend! And Darwin as indeed grown. He is a very fortunate family member! I was just thinking about the two of them the other day. You are not the typical blogger talking about their pets…that is for sure. What an interesting post – your text and photos are really wonderful. I had no idea a tortoise could push a door open or that they’d grow so fast. Is Darwin larger than he’d be in the wild? Wonderful to see these two getting on so well, Debra. And you have ice! What a turn up for the books! This is my first visit and I am already intrigued with Darwin. His “baby picture” caused me to gasp! How old is he? Love this! Darwin is too stinkin cute! Totally need to do a children’s book!!!! Every time you show “before & after” photos of Darwin I’m amazed. You sure do take good care of him. And Pinky has good reason to keep an eye on him. He’s got his eye on her food and is probably trying to figure out how large a fulcrum will be needed to move that umbrella stand out of the way. He’ll figure it out. He’s got plenty of time. Feel free to write about your star boarders as often as you like, Debra. You can count me as a fan. To Darwin …. you’ve come a long way baby …. and HI Debra! .. it’s good to be back. The continuing adventures of Darwin, co-starry Pinky. You made my day, Debra. Cold and wet here, but, nothing like the east coast. Dear Debra, I, too, was wondering how old Darwin was, but I read your response to “Patricia Sands” and discovered the answer: 5 1/2 years. Wow! To grow from that tiny individual in the palm of your hand to a 30 pound behemoth! I do so like to read about Darwin and Pinky and I’m like another of your reader–wondering what would happen in a race between the two of them. Peace. Thanks, Karen. I do enjoy showing them off once in awhile! 🙂 They are our little pals! 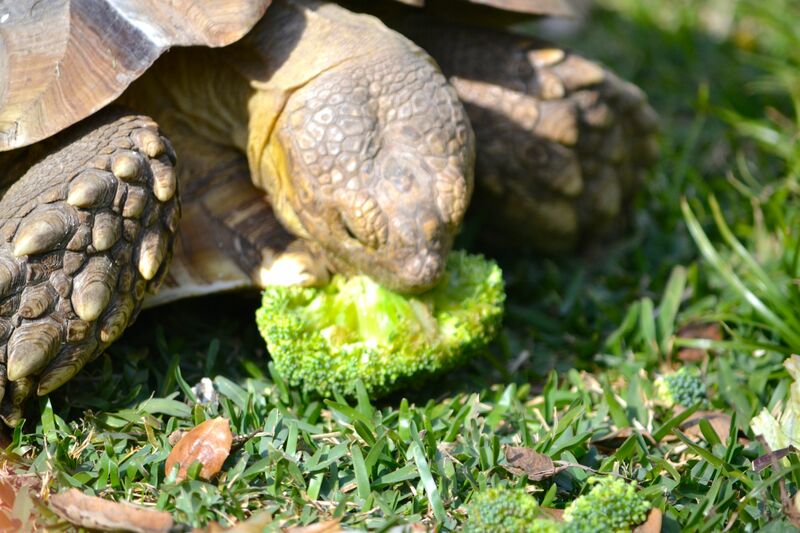 I recently learned that perhaps I’ve giving Darwin too much broccoli! I presumed it was good for him, but I need to direct him to more grasses and leaves. I have a feeling he’s going to be very irritated! Who knows what he’ll demand next? LOL! And Darwin is apparently just getting started…he has the potential to double his size in the next five years! Darwin and Pinky would be so glad to know they have admirers! 🙂 Thank you! Darwin’s body language speaks volumes; so does Pinky’s! 🙂 The Darwin Fan Club, so true Debra! and what a teeny tiny cutie he was once upon a time! How old is he now? I really enjoy sharing photos of Darwin, Claire. I have a hard time showing exactly how large he really is. Somehow in photos I don’t think he appears quite as large as he is. He will be six years old this spring. He is still just a baby! Can you imagine what another 10 years will bring? Ha! Darwin is quite the character. Glad to see he’s still entertaining you.